If you’re a collections professional but can’t come to the OpenCulture Conference, why not visit the accompanying exhibition – for free! If you're interested in the latest CMS and DAM software, storage systems, document scanning, visitor guides, high-res cameras, digitisation services, or environmental monitoring, you can find experts willing to help. Find out more. For the first time, exhibitors will deliver Quickfire Updates in a theatre space on the exhibition floor. These will provide an excellent opportunity to get up to speed with the latest developments and cutting-edge technology. Don’t miss out - register as a visitor today. Pioneering interactive production company and technology provider INITION has partnered with the Collections Trust to present a unique 3D experience, where you'll learn how 3D can enhance your museum experience and receive a free 3D facial scan! Find out more here. On Saturday 21st of June, Open City Docs Fest presents two events from the Harvard Sensory Ethnography Lab (SEL). Currently the talk of the documentary world, SEL work between the factual and poetic, challenging classic ethnography and documentary film. An eclectic selection of rarely seen short films produced by artists working within the Harvard Sensory Ethnography Lab. Manakamana is the latest work to emerge from the Harvard Sensory Ethnography Lab and is a startling, one-of-a-kind documentary experience. It is filmed entirely inside the narrow confines of a cable car transporting villagers to an ancient mountaintop, temple high above a jungle in Nepal. Over the course of eleven rides we gain a fascinating and personal insight into the lives and perspectives of these passengers. For more details of these two events and for the rest of the festival programme please the Open City Docs Fest website. India-UK: Connections through Culture is an initiative by the British Council which aims to build lasting relationships between cultural organisations, museums and heritage organisations in the UK and India. As part of the India-UK: Connections through Culture programme, the British Council is offering travel grants for trips to India and is inviting applications from non-national museums in the UK. The aim of the travel grant scheme is to enable non-national museums in the UK to build and develop institutional links, to share skills and to create and develop joint projects and exhibitions. Opportunities are available for grantees to work with cultural institutions, museums and heritage organisations throughout India. In addition, there are two large-scale international platforms for the Visual Arts in India in 2014-2015. The Kochi Muziris Biennale will be taking place from mid December 2014 until March 2015 and the India Art Fair will take place from 29 January-1 February 2015. If these events are of interest to your institution, the British Council can help by facilitating introductions and providing information about specific opportunities for engagement. The travel grant of £2000 will cover the total costs of a week-long visit to India, including the cost of visas and inoculations. The British Council will provide a letter of invitation and advice, but visa applications, travel, accommodation and meetings must be organised by the grantee. On completion of the visit, the grantee will need to submit a short report giving details of meetings, visits and potential outcomes. Travel to India needs to be completed by 28 May 2015. The deadline for applications is 18 July 2014. Applicants will be notified by 1 August 2014 . If you would like any further information, please contact Jane Weeks or on +44 (0)7811 761639. The last 15 years has seen a proliferation of large-scale international recurrent exhibitions of contemporary art across the globe. Looking at UK only, 2014 sees the presentation of the Liverpool Biennial, third Folkestone Triennial, and in Japan the fifth Yokohama Triennial and inaugural Sapporo International Art Festival. The latest edition to the growing number of periodic arts projects and international exhibitions of contemporary art, Sapporo triennial joins over 150 such projects currently operating internationally. They often share similar objectives, practices and considerations, from curatorial and artistic strategies to political and economic agendas. Many of the exhibitions are focused on the encouragement of public engagement, in the local context to create a site of public participation that is not only periodical, but also permanent. 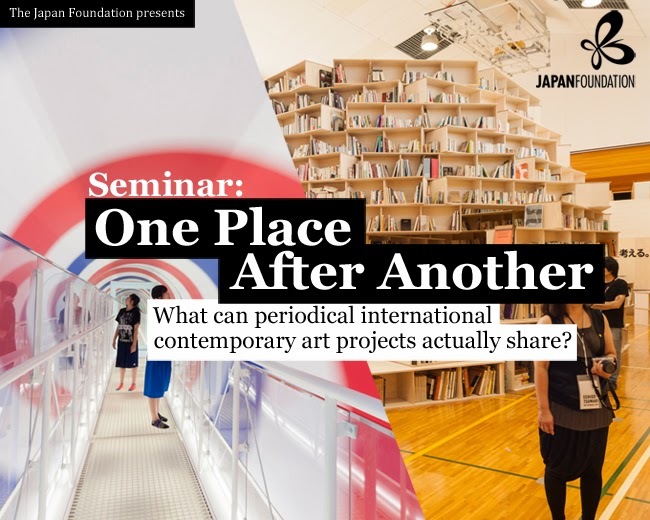 Questioning and reflecting on the circumstances that inform recurrent international exhibitions, Keith Whittle, researcher and Japan Foundation Fellow, will explore and highlight some key strands of a number of periodic exhibitions through specific examples informed by research in Japan and the UK. Followed by a panel discussion to further examine issues related to the projects, Whittle will be joined by two internationally recognised curators, Yuko Hasegawa and Lewis Biggs, both responsible for curating a number of major exhibitions, including in Sharjah, United Arab Emirates and Aichi, Japan respectively, and Koki Tanaka representative artist, Japan Pavilion, 55th International Art Exhibition, Venice Biennale. The talk and discussion will also explore amongst other questions, if these arts projects and international exhibitions can expand and democratise access to culture, for a diversified public, creating a meaningful cultural social space for a general public and tourist majority generally less directly engaged with Art? The Oriental Ceramic Society, London, invites applications for the George de Menasce Research Grant. The grant of £1,000 is intended to promote new research in the field of Asian art and to support specialized studies. The successful candidate will be required to read a previously unpublished paper on his or her research results to the Society, of a level suitable for publication in the Society’s Transactions. Applicants are invited to send a research proposal (maximum 200 words) with a short CV (maximum 100 words) to the Society, to arrive no later than June 30th, 2014. The winning candidate will be informed by September 1st, 2014 and will be asked to lecture to the Society in December of 2015. Please send your application via email to Mary Painter.